Scheduler: Automatic refresh with missing file? Hi, we just encountered a behaviour where a scheduled job has gone through a refresh of an .iok file despite the fact that one of the excel inputs was missing. I would expect the process to fail in this case. Is there something we can do to fail the chain of actions if input files are missing? I presume that you are appending all sources and one of the sources was missing. Try to use validation block to look if all sources are there, once validation will fail omniscope will not push any data further. This seems to happen regardless of whether the files are appended or not. For example, the attached file, that simply has one non-existent excel input, will happily run through < schedulerFileActionRefreshFromSource/> command and not fail. The iok won't actually refresh. I agree that I can put custom validation here as well, but was hoping for a solution that is easier to apply to all the files that are being potentially affected. Hmm unfortunately still runs as if the file is there. I added failOnError="true" to every sub-action just in case too. Many thanks for your feedback, and apologies for the late reply. You are right, the "Refresh From Source" action didn't respond to failOnError="true", as it should. We just implemented that change, and you can find it in the next release (2.9 b1343 or later). - Select the task you want to modify and click the "Edit selected" button. 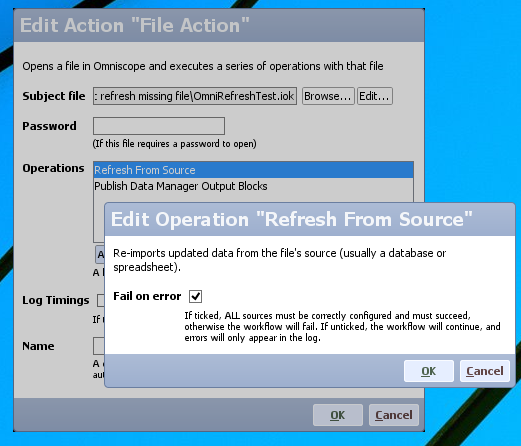 - In the Operations list, select the "Refresh From Source" operation, and click the "Edit selected" button. - Now, you will see a dialogue with a checkbox labelled "Fail on error". - When ticked, any failure refreshing, like a missing file, will stop the workflow at that point and no further operation will run. Do let us know if there's any further problem, or something doesn't work as expected! Thanks Victor, I will give it a try and let you know if there are any problems.